Writer’s Stop Devotees will remember that this location opened as an homage to Ellen’s Buy the Book from her first sit-com, “Ellen” — thus all of the TV studio lights…with a couple of strategic hidden mickeys thrown in! 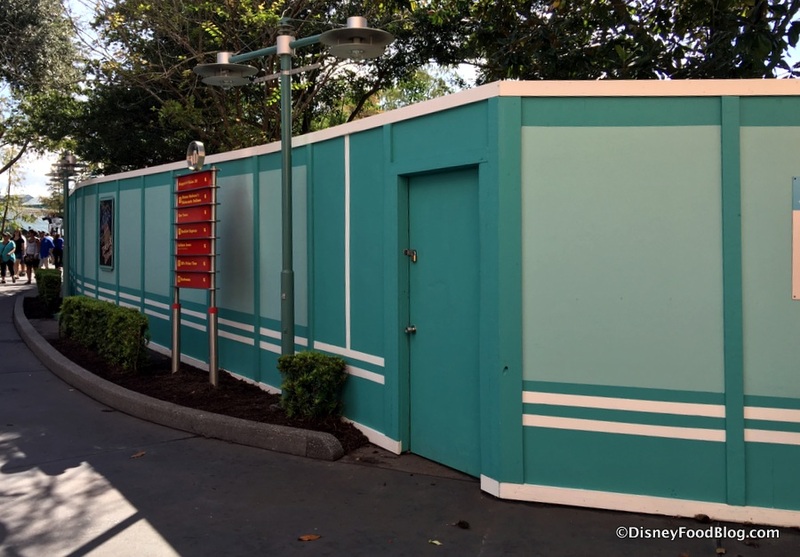 Back in the day, this area housed a little window table for one. I spent many relaxing hours sitting there watching the world go by! 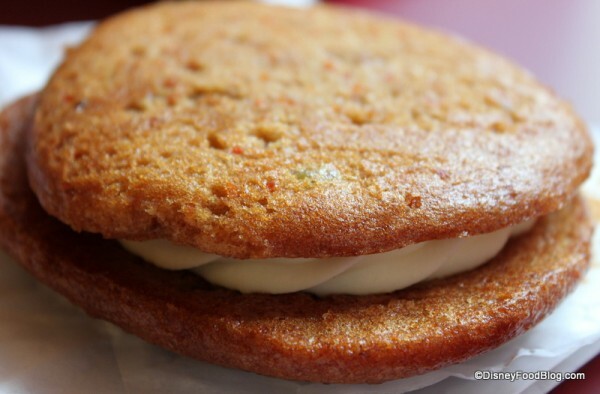 And regarding the food — aside from one brief lapse of time, Writer’s Stop remained the original home to the snack that put it on the map to begin with: the Carrot Cake Cookie. 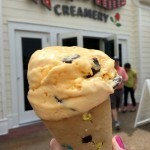 Though the spot also carried some terrific traditional cookies, enormous Danish pastries, and an array of classic Disney confections, what brought us back again and again was this single signature snack. Here is what the Writer’s Stop — or rather, the area surrounding it — looks like now. 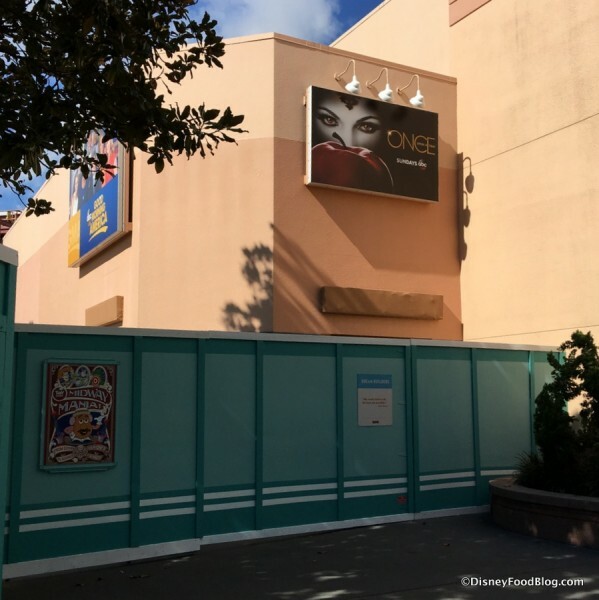 And if you’re heading towards Sci-Fi Dine-In Restaurant, you’ll walk by those construction walls surrounding Writer’s Stop. By the way, you can still find the Carrot Cake Cookie at Sweet Spells. And I’m sure it’s still delicious. But moving forward, I don’t think I’ll be able to taste one without a huge wave of nostalgia for its original home. 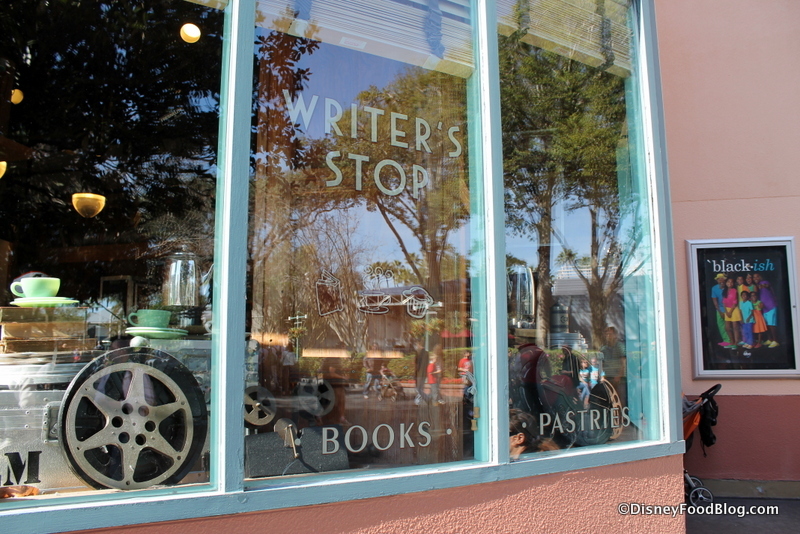 Thanks, Writer’s Stop, for all the Carrot Cake Cookies (seriously — LOTS of them), all the peaceful, happy moments, and all the great memories. You will be missed. Do you have fond memories of the Writer’s Stop? Please let us know with a comment. Rumor: A Second Chance for Writer’s Stop? Never stopped there. I have no idea, as an absolute book lover, why not!? I really liked the Writer’s stop. We bought the book “Be Our Guest” there to help improve customer service at our business, and of course, we ate the carrot cake cookie. The cookie was so sweet that my partner and I couldn’t finish it, not that it wasn’t good, but just because we had been eating so much all day. I put it in my backpack and found it a few days later! 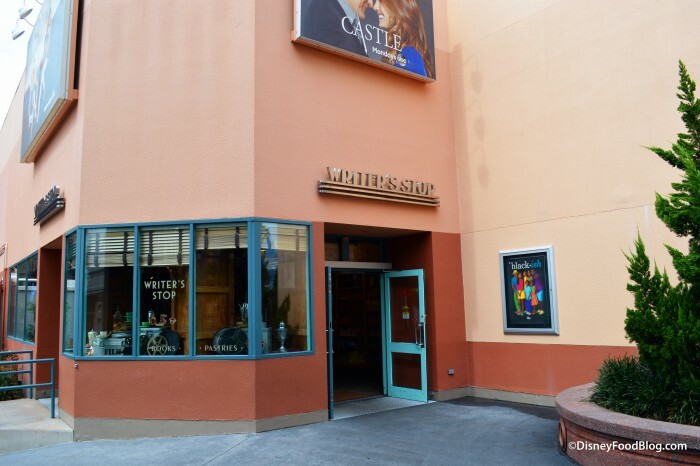 The Writers stop was usually empty, as I could see, as much as it is beloved by the fan community! BTW, i never knew it was based on Ellen’s old show! I am a big fan of her and now I’m really sad it is closing. I’m going down to Disney in a week and your telling me my number 1 go to shop is closed? 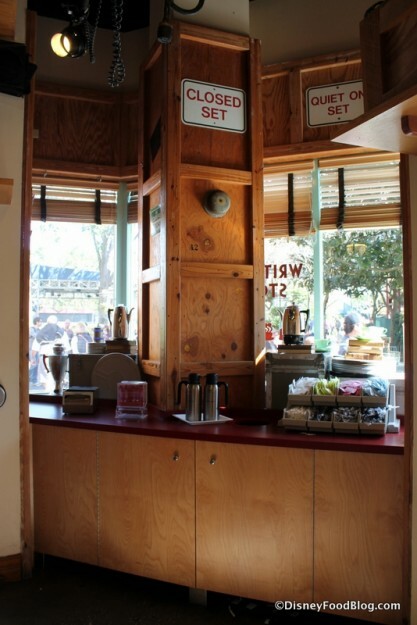 I will always remember the Writer’s Stop as one of the few places in WDW where you could get a good cup of coffee that was not Nescafe outside of the signature dining restaurants. I think they served Joffrey’s before Joffrey’s had the present contract with Disney. It was also a great place to find Disney Music CD’s. This was my store. 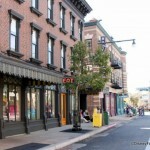 I worked here for a year in 2000 (floating occasionally between Backlot and The Newsstand on Streets of America). I am in tears that it’s gone but will never forget the night I learned how to use the espresso machine and burned my finger, the classic Disney movies on the tv, the rice krispy treats, the way the store was so small yet seemed to handle the crowds like the bigger stores. My heart is here in this store and I will miss it so very much. So sad. We stopped there for coffee and a sweet on every visit. 🙁 So sad to see it go. I’m still in mourning at the loss of that window seat. It was awesome. RIP Writers Stop. Thanks for the memories. Loved to get a hot tea there and make fresh ice tea and get a treat too!!! 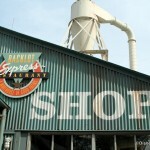 This was one of my family’s favorite place. They always had a nice selection of Disney DVD’s only bought food a couple of times but liked to hang out here as a hidden respite. I am sad by this but I know something good is coming. I knew it was coming, but it’s still so sad. There were many mornings we would rush out of the resort without getting coffee. When my caffeine withdrawal headache would hit, Writer’s Stop always saved me. I still remember the first time we stumbled upon it. 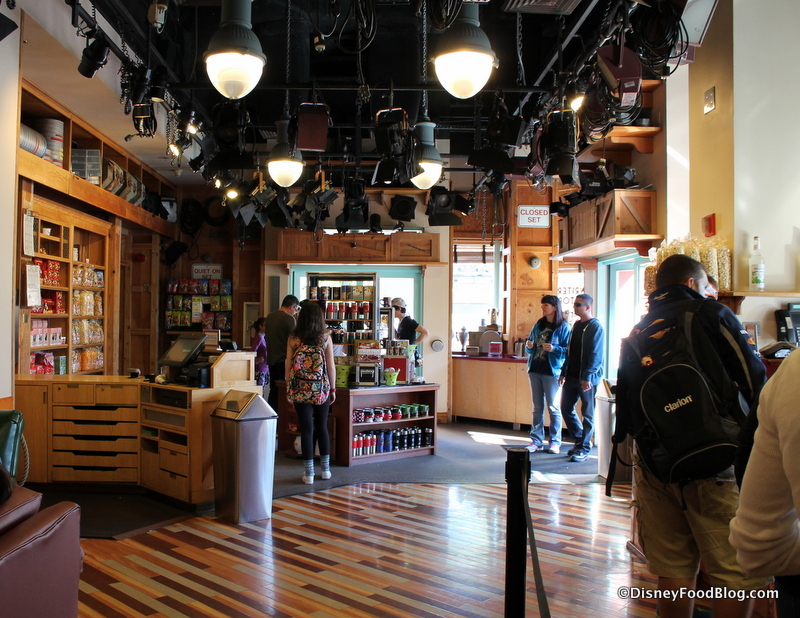 We’d been to Disney 4 or 5 times before we realized that it was indeed a shop and not a façade. It was always a respite from the crowds, and I loved sipping my coffee and looking at the books or planning out the rest of our day. 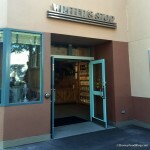 Thank you for the memories, Writer’s Stop. You will be missed. A sad end for the Writer’s Stop. I will always remember it for the place in which I first met Ridley Pearson at a Kingdom Keepers book signing. Also loved the comfy couch that used to be there, the tables with their high height chairs and of course the wonderful sweet treats. The Writer’s Stop didn’t have a large footprint. Why couldn’t Disney fit it into the expansion plans? So many cherished attractions, clubs, stores, etc. have been demolished as Disney paves the way for future income generators. Change is not always good. 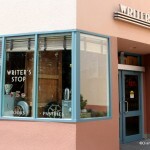 RIP Writer’s Stop, you will be missed along with the Streets of New York and the Osborne Lights! After reading your blog, I finally stopped in for the first time on my trip last fall. My mom and I ordered the carrot cake cookie and browsed the delightful selection of books. I’m so glad we were able to visit before it closed! It is was a special little nook, one of those neat little places, a hidden gem you would tell only your closest friends to go to so it could stay a hidden gem. Every time we passed it or stopped in we reminisced about the first time we stopped to get the infamous carrot cake cookie. I think we got 6 between the 4 of us only to find out upon exit they were serving half cookie samples free out the exit door, lol! Loved the white chocolate macadamia nut cookie. They haven’t had it in a very long time though. Sad to see the place go. One has to wonder how long Sci-Fi will be there. Soon it will be so out of place in the middle of what is coming. An absolute hidden gem and something really different… Like all things that fall under that headline these days – gone. I’ll miss you this little peaceful getaway. You’ll be sorely missed Writer’s Stop. I remember my first visit to this place – I bought a huge 90s-style Ellen coffee mug, despite the fact I had to get it home to the UK and I don’t drink coffee. I also remember my last visit, this March, on a solo visit to the park where I wandered around with my carrot cake cookie soaking it all up. Thanks for the memories, Writer’s Stop. I stopped in there last fall and bought a carrot cake cookie on your recommendation. It was delicious! This was a spot I never missed. I loved the selection of books, the friendly staff and good coffee. 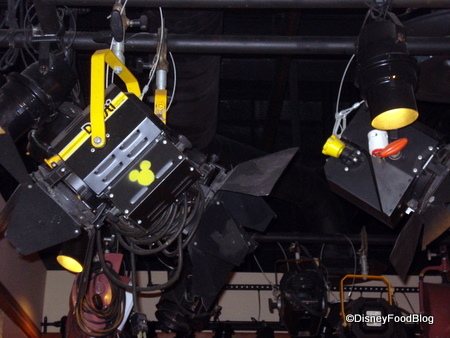 I hope Disney will find a replacement for it. I too spent many hours on the window-seat stool reading while my party went off to ride ToT. But my favorite thing was that as soon as I got off Star Tours I’d book down to The Writer’s Stop & Jedi “Force Wave” the doors open. 😉 I will miss this little oasis of calm very much. We visited here many times ! They had the best (and biggest) muffins and danish. Often we would stop right before we left the park and buy these to have for breakfast the next morning !!! Everything was delicious ! We are so sad so see it closed. Disney should reconsider and reopen this special store !!! Carrot Cake Cookie!!!! Waaaaaaaaaa! I always had to walk in, smell the goodness of books and coffee, buy a cookie, and continue on my way. Loved this little place! We made it a point to always stop at The Writer’s Stop and pick up a snack or something to drink. We would spend time looking through the books as they had one of best catalogs of Disney books. The Stop was also a great place to sit and cool down for a minute. To bad they had to close, but every time we round that corner someone in the family will probably bring the The Writer’s Stop up. Can this shop be resurrected in the new Hollywood Studios? The space just re-opened as the Baseline craft beer bar yesterday – 10/10/17. Nearly a year after Disney-MGM Studios was renamed, there was still a reference to the old park name that had not been caught. You had to look under the counter at one of the bar wood walls, D-MGMS was printed on it. Grabbed a photo. 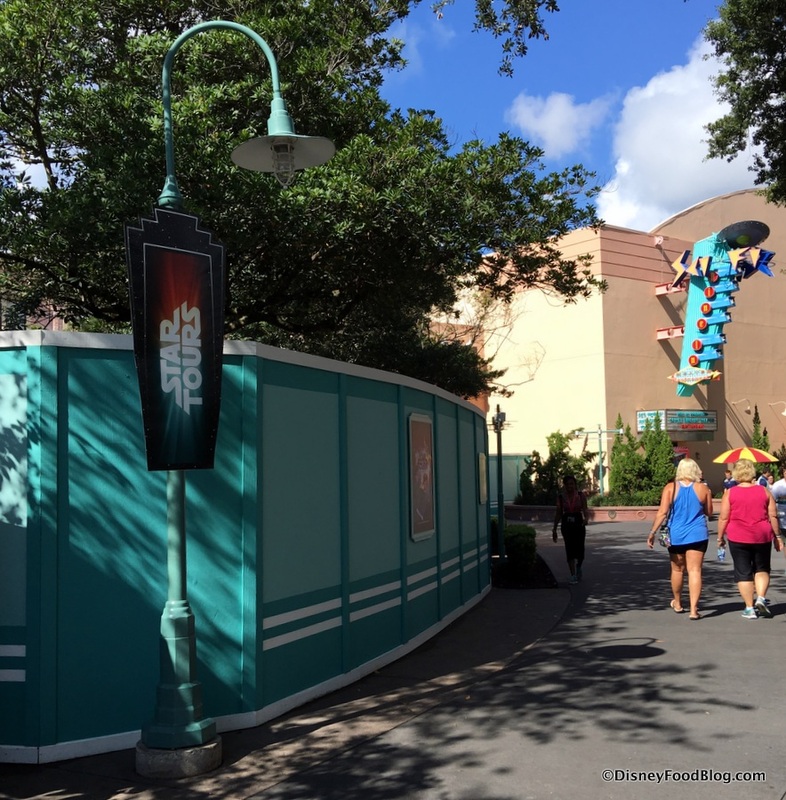 Perhaps it was the last indication of the old park name anywhere in the park. I am a former cast member who used to work at the Writer´s stop. Can´t tell you how much it hurts to see all my “physical memories” from that wonderful shop go away. What a special shop it was! I´ll keep it in my heart forever!